Members of the Gardai at the scene of the shooting of Michael Barr at the Sunset House Pub in Dublin. 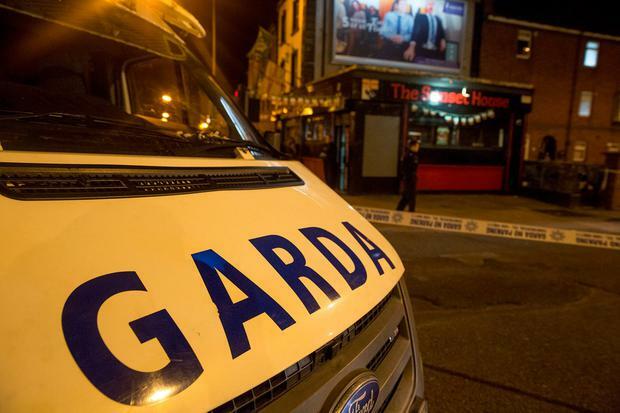 A man has been charged at the Special Criminal Court in relation to the murder of Michael Barr at the Sunset House pub in Dublin. Mr Barr was shot dead at the pub almost two years ago. Martin Aylmer (31), of Casino Park, Marino, Dublin 3, was charged yesterday at the three-judge, non-jury court with participating in or contributing to activity intending to facilitate the commission by a criminal organisation or any of its members of a serious offence, namely the murder of Michael Barr at the Sunset House, Summerhill Parade, Dublin 1, on April 25, 2016. He was also charged with participating in or contributing to activity being reckless as to whether said participation or contribution could facilitate the commission of the murder of Mr Barr. The offences are alleged to have occurred between April 23 and April 25, 2016. Garda David Chapman, of Bridewell Garda station, gave evidence of the arrest of Mr Aylmer. Gda Chapman told State solicitor Michael O'Donovan that he arrested Mr Aylmer at his home address yesterday morning and informed him of a number of charges he was facing. He then took the accused to Bridewell Garda station, the court heard. He said that Mr Aylmer made no reply when cautioned. Mr Justice Tony Hunt, presiding, sitting with Judge Patricia Ryan and Judge Ann Ryan, remanded the accused man in custody until today, when a bail application is expected to be made.